Perhaps it can go without saying, but I'm saying it anyway -- Sheldon Brown is the ultimate internet resource for the cyclist with a technical bent, especially when restoring old bikes or converting bikes to fixed-gear or single-speed. 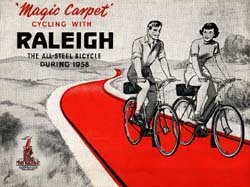 Sheldon's Retro Raleighs site has been indispensable to me in realizing my latest project. I've been back to Sheldon Brown's fixed-gear site untold number of times while building up my fixed and ss projects. The adjunct site, Harris Cyclery, is also an indispensable resource for information and hard to find parts.